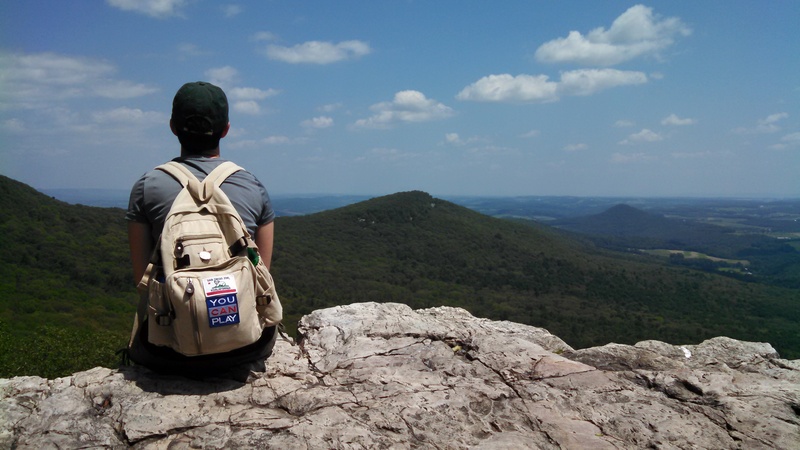 Last weekend, I did a nine-mile hike that included parts of the Appalachian Trail. The notable landmarks on that section are The Pinnacle and Pulpit Rock, and you can see one from the other. In the image below, the upper-most white fleck on the central peak is The Pinnacle, which I could see, but when I looked through binoculars at the same place, I couldn’t see the hikers there scrambling around the rocks. I’m really bad at seeing through binoculars, the same way I am with microscopes. I have to turn them sideways, look with just one eye, to see anything at all. You can see a long way from here. But my naked eyes do what I need them to. This view is beautiful, and while we walked, my mom said, more than once, how amazing it would be in autumn, when this valley and these mountains go up in deciduous flame. My dad, who reads a lot about these trails, said that Appalachian Trail through-hikers count Pennsylvania among its worst sections, and it’s not for the miles and miles of up-down, up-down, but for the scarcity of places like this, where the trail breaches the trees and all the land lays bare. Pennsylvania’s got the worst views. This one, and the one opposite, are the points of relief. This, the consensus seems to be, is what people have come for—at least the ones who aren’t doing the trip at speed. Between The Pinnacle and Pulpit Rock, there are long stretches where the trail disappears. I don’t mean that the blazes disappear, or that it’s easy to lose one’s way—I mean the foot-trodden earth, a bare, flat stripe sometimes two feet wide, sometimes wide enough for an ATV, is gone. In its place are “the Pennsylvania rocks.” The links to the searches are there because I did a half-hearted attempt at finding out some geological information, and then I abandoned it because the real story of the rocks are their reception. The composition of the rocks isn’t important just now, save that their rough grain will chew up shoes and they’ll rasp off skin in the smallest stumble. And they’re more bone than rock, the cracked spine of the ancient Appalachians, showing here and there where the mountains have weathered, here and there where a glacier cut and spit the rocks like an owl pellet. They are what remain. On these long outcrops, the volunteers who maintain the trail put blazes on the rocks themselves so that hikers know they’re going the right way. On the far side, wherever the rocky patch ends, the tidy earthen trail will be visible. The blazes, though, can only say this way, not which way: you have to find your own way over and through. This is my favorite hiking. Maybe it’s because I grew up not so far from where we walked, because I spent the summers of my youth camping all over the state but mostly in places where the ground looked the same: paths of velvet leaf-litter that gave way here and there to springs and little boulder-fields, ground that begged my feet to leap. There is plenty to look at, but it’s all down: where to step next, which route to take, whether it’s worth the scramble up or the shimmy down, simply because it would feel good to do it. When the route is this finite, the decisions are different, easier. For only nine miles, it can stay my favorite. For a hundred feet at a time, I’m content to let that be the center of my attention, pleased at each small choice. Each outcrop of rocks offers a chance to make wholly new ones: this time following the highest possible path; the next, the path where I have to stretch, and sometimes I forgot thirty-something and what might happen long enough to leap a little. I re-started the new novel for the fourth time. Each time I’ve re-started, it felt like I’d found the right trailhead. Each time I’ve re-started, I made a dozen different small decisions. With each page, there are dozens more. Choose your own adventure. Each time I restarted, I felt like it had chosen me. While we sat for a few minutes at Pulpit Rock, which, like The Pinnacle, was crowded because last Saturday was the first Saturday without rain in a good long while, someone looked at a circling turkey vulture. First, the bird was named hawk because we weren’t far from Hawk Mountain. Another person said, Look, a golden eagle. I thought, for a bird with a ridiculous red head, small and naked to better accommodate its eating habits, for an animal so perfectly designed to scavenge flesh already baked black to splaying ribs, to be called that meant it was doing all right. It had the same view of any bird, any creature, winging at that height.